Dr. Thomas Heldt, a German genealogist and historian, has been working for many months in order to verify my hypothesis concerning the origins of my ancestor, Philip Long. This hypothesis simply states that a German mercenary by the name of Philipp Lange could have become Philip Long during the American Revolutionary War of 1775-1783. Two German bothers from Wirmighausen, Germany, arrived in New York in 1776 as mercenaries hired by the British government to fight against the Continental or Revolutionary army. They were Heinrich and Philipp Lange. After the war, Heinrich went back in Germany. But, Philipp did not. During the war, Philipp was classified as a deserter. Two years after his desertion, a soldier by the name of Philip Long appeared in Florida and was now part of a Loyalist company. He could be the same soldier who deserted again to another Loyalist company, the King’s American Regiment. We know for a fact that my ancestor was part of the KAR for the last two years of the ARW. Since we don’t have any document to support my hypothesis, I decided to resort to DNA testing. The task of Dr. Heldt has been to find relatives of the family of Heinrich, hence Philipp Lange’s family. My research is a documentary one, which means that my opinion, or the one of anyone else, is irrelevant. It is a priviledge to work with Dr. Heldt who is highly proficient and very motivated to get at the end of this quest. The result of this research is now totally dependent upon his will and his sophisticated skills. Dr. Heldt has succeeded in identifying and locating the relatives of these two German soldiers. Many of them live in the area of Buchenberg. Lately, he has sent a letter to nine of these relatives asking them to submit a sample of DNA in order to prove or to disprove my hypothesis. The result will be unquestionable. 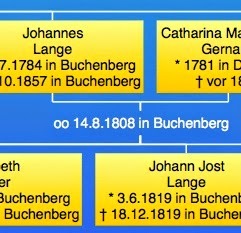 I have the family tree of Heinrich and Philipp Lange. Surely, it is not appropriate at this time to make it public. Here is a good portion of the letter sent to the nine candidates from Buchenberg, Germany. 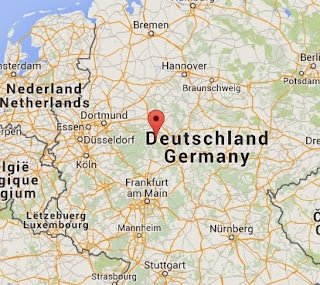 The area of Buchenburg and Vohl, Germany. At the end of 2014 I received an inquiry from Canada. The topic was, to find out more details about the origin of Johann Philipp Lange. This Johann Philipp Lange was a soldier in the 3rd The Waldeck regiment that was part of the auxiliary troops that supported the British troops in the ARW (1775-1783) against the rebellious North Americans. According to HETRINA (Hessian Troops in North America) Johann Philipp Lange was born in the parish Adorf, or more precisely in the village Wirmighausen. An inquiry of my Canadian client to the Adorf vicarage brought no positive result. After a short research, in the „Landeskirchlichen Archiv“ in Kassel in the church records of Adorf, we were able to find the Confirmation record of Johann Philipp Lange 1766 in Wirmighausen. Johann Philipp Lange took part in the campaign from the time of his recruitment 1776 in Korbach till August 1778. On August 27th 1778 he deserted from the regiment, which stood in an encampment on Staten Island near New York during this time. Many of the deserters of the auxiliary troops joined the army of the rebels later on. A bigger group of them settled down in Canada after the war. Here the research of my client Donald Long in Canada increasingly starts, who has a forefather with the name Philipp Long, who lived in Canada at the end of the 18th century. Donald Long is the owner of many documents, which bear Philipp Long’s own characteristic signature. Therefore I was in search for a document, which was signed by the soldier Johann Philipp Lange by the recruitment or in another connection. Sadly such a document could not be found. Our aim was to confirm that Philipp Long and the Waldeck soldier Johann Philipp Lange were one person. Comparison of the signature could not help in this case for just mentioned reasons. Thus remains to the clarification of the question, if Philipp Long is identical with Johann Philipp Lange from Wirmighausen just the possibility of a DNA analysis. 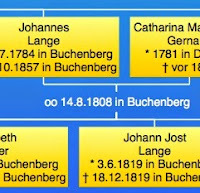 Important in this connection is the Y chromosome, which is left bequeath by the father on the son, that means, that all male descendants of Johann Philipp Lange, his brothers or other male members of this family have identical Y chromosomes! Because Johann Philipp Lange stayed in North America after his desertion 1778, he of course could not have male descendants in Europe. But he had an older brother Johann Henrich Lange, who was confirmed 1763 in Wirmighausen. He also served in the 3. Waldeck pay regiment during the campaign in North America, but in contrast to his brother he returned with the rest of the regiment to Europe in 1783. He came back to his home village Wirmighausen and married there Maria Elisabeth Möhle in 1784, with whom he had three children. One of them was their son Johann Conrad Philipp, who was born in 1787, but already died at the age of 12. Also here, there were no further living male descendants, which could be researched till today. Therefore there was only the possibility, to search for other male relatives of the Lange brothers in Wirmighausen. In the marriage entry of their father Johann Paul Lange is mentioned, that he was from Buchenberg (after another source from Vöhl). In the church records of Vöhl I could find the baptism of Johann Paul Lange 1717, the son of Henrich Lange, then Vöhlischen cow shepherd. But this Henrich Lange had another son with the name Johann Adam Lange, who was born 1713 and was the first born child. These two brothers settled down (maybe with their parents) in Buchenberg. Whereas Johann Adam Lange stayed in Buchenberg, Johann Paul Lange (1740 evidently in Buchenberg) went to Wirmighausen and married. As already mention, the aim of the archival research was, to investigate living male descendants of the Lange family, who have identical Y-chromosomes, to allow comparison with the DNA of my client Donald Long. As you can see on the attached pedigree, Johann Adam Lange and his first wife Anna Elisabeth had an abundance of descendants, which I could find out on account of intensive research in the church records at least till 1900. There are existing blocking periods for church records, for reasons of privacy protection, therefore church records are only available for research in certain years (retrospectively blocked are: baptisms c. 100 years, marriages c. 80 years, burials c. 40 years---depending on denomination and regional church). About 1910 there were descendants of Johann Adam Lange living in Buchenberg, Marienhagen and Vöhl. However there was also another family Lange in Asel, which has nothing to do with our Lange family. Their forefathers descend from another family with the same surname. 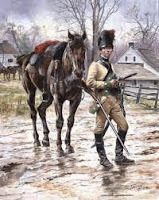 My client Donald Long in Canada has for a long time intensively researched the history of the ARW and was and still is in search of evidence for his theory, that Philipp Long in Canada is identically with the deserted Waldeck soldier Philipp Lange identisch gewesen ist (see in addition http://philiplong.blogspot.de). Because all relevant documents are researched, we are in search for male descendants of JAL in Buchenberg. As I have told before, these were living around 1910 in Marienhagen, Vöhl and Buchenberg. I would like to point once again on the attached Lange pedigree (descendants of Henrich Lange), on which the relevant family members could be found. If you should be a descendant from on of these Lange families, it would be very kind, if you could get in contact with me. As mentioned several times, my client is in search for a male candidate for a DNA test, who is descendent from the above-mentioned family. Besides, Donald Long will pay the full cost of this DNA analysis and the outcome of the analysis will only be sent to you. My client has no access to the results. After the analysis is done, we could compare the outcome of his DNA analysis with yours concerning the Y chromosome. Donald Long depends on your help, to verify his descent from the soldier Johann Philipp Lange or to reject it. Even for you this free DNA analysis has some advantages. You get to know, to which people (Germans, Celts, Slavs) your male ancestry line belonged and with the help of the DNA database of the institute (www.igenea.com), which carries out the analysis, you can find further relatives all over the world . Donald Long and I would be very pleased, if you were willing to help us in this matter.